May | 2008 | Shelf Elf: read, write, rave. Yesterday I came home to piles upon piles of books (OK… it was 7 books, but they’re free and they were waiting for me, and that’s pretty fantastic). Even more fantastic is the fact that one of these books is RAPUNZEL’S REVENGE by the lovely Shannon Hale. Yippee! Hooray! Jubilation! I’ve been wanting to read it ever so much, especially after Miss Erin’s gush-fest. Now I can. I love the sound of Band Geek Love. Let the YAYAYAs make you love the sound of it too. I was a total control freak and band geek in high school, so I’m all over this one. 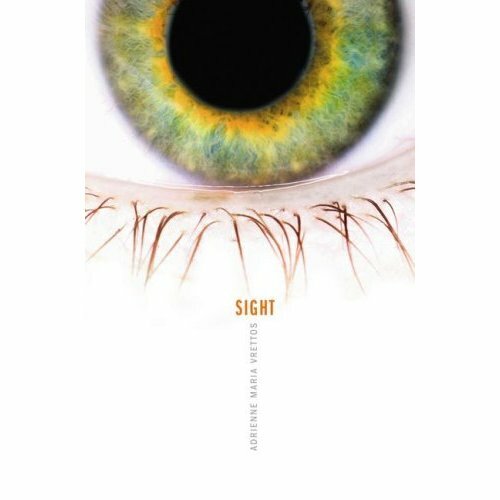 Daphne and Coe over at The Longstockings recently interviewed Adrienne Maria Vrettos, the author of Sight, which is about a girl who happens to be psychic. It sounds exciting – a glimpse into an experience so out of the ordinary. Jen R lets us know that The Mysterious Benedict Society and the Perilous Journey (the sequel to The Mysterious Benedict Society) is, in her opinion, “slightly stronger than the first.” Sold! 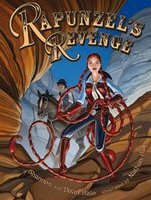 A new Karen Hesse book? Cannot wait. Fuse #8 tells all in her review. This entry was posted in Just Cool on May 31, 2008 by shelfelf. I read the Graphic Novel memoir To dance, by Siena Cherson Siegel and Mark Siegel, for the first time quite some time ago. 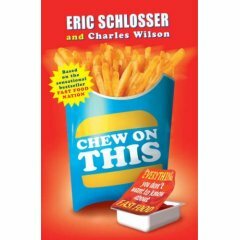 Then a week ago I read Miss Erin’s SBBT Interview with Siena Cherson Siegel and it inspired me to read it again. Now that I’ve reread it, I realize, I need my own copy. This is a book filled with heart, warmth and passion. There are some books I know I will want to be able to read again at different points in my life, and I think this is one of them. One of the aspects of this Graphic Novel that impresses me the most is the fact that the story is told in a way that is completely natural. It’s not dressed up or fanicified or overdone in any way. Siena Cherson Siegel tells the simple story of her journey into dance, her family life, her growing up. It’s like a true sliver of someone’s life, not glamorized. This sort of story gets into me more than any overly dramatic plot line ever can. Of course, the other reason this slim text is remarkable is Mark Siegel’s art. Every page is a rich visual experience. The palette is bright, with many petal-hued colours, and the images are full of energy and movement (no surprise!). There are so many images that will just stop you in your tracks. I slowed down especially at the section when Siena is experiencing the wonderful busy intensity of backstage life for the first time, and then you draw in close and everything darkens as she watches the dancers all alone from the wings. Wow. You are right there. 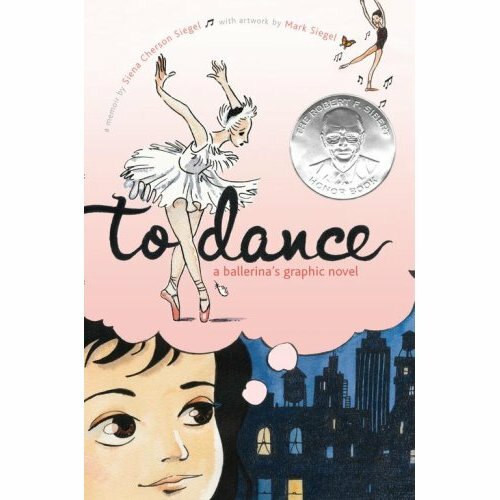 If you haven’t read To dance: a ballerina’s graphic novel, you really ought to. It belongs in every library, and in the hands of all young (and not so young anymore) dancers, artists and dreamers. Enchanting. More information can be found here: To dance. And here’s a brief interview with Siena at School Library Journal. This entry was posted in General on May 29, 2008 by shelfelf. 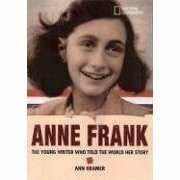 Anne Frank: The Young Writer Who Told the World Her Story by Ann Kramer is part of National Geographic’s World History Biographies Series. The biography is marketed as an introduction to Anne’s story for readers who might not yet be ready to read her diary. The format of the text is very visually appealing, with excellent balance of text and images, numerous photographs of the Frank family and the Secret Annex, and a timeline that runs along the bottom of the pages throughout the entire book. You feel like you are getting a real glimpse into Anne’s world and experiences. The background of some of the pages is the same plaid pattern found on Anne’s actual diary itself, which I think is a lovely design touch. The text is divided into manageable sections focusing on Anne’s early years, the period of hiding in the Secret Annex and the family’s discovery and deportation. Interspersed throughout are several sections to provide background information or context on the historical period (Jews In Europe, Kristallnacht, The Holocaust). The writing is straightforward and accessible. National Geographic is pitching this book for the 8-12 range. I don’t think most 8 year olds are ready for the intensity of the content here, not to mention the strong images related to concentration camps in the section on The Holocaust. As always, presenting a text with this type of content means that you have to really know the child who will be reading it. In fact, I think that in some ways, if a child isn’t ready for Anne’s actual diary, they might not be ready for this book. I first read the Diary when I was about 11 or 12, and I would have really been interested to have this book at my side. It would be a good companion text for Anne’s beloved book. 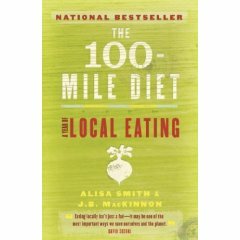 You will find a listing of the other titles in this series at National Geographic.com. 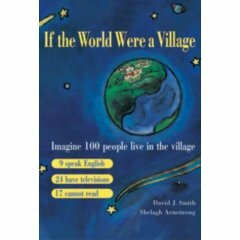 This entry was posted in Non Fiction, Openmind, Teacher Titles on May 26, 2008 by shelfelf. Discovering a wonderful book that was not published 5 minutes ago always makes me feel like I’ve unearthed something secret. The fact that all of the hype and discussion and chatter about the book has passed is quite freeing to me as a reader. I can just experience the book for what it is, and not feel pressured to feel the same way about the book that the rest of the world feels. It’s like coming to a new place without any preconceived ideas about it. Sometimes it’s refreshing to step out of the whirlwind of what’s new and what’s hyped and to explore the many, many worthy books already out there. The Color of My Words by Lynn Joseph is this kind of book. It’s not new. It’s just lovely. It tells the story of Ana Rosa, a twelve-year-old growing up in a small community in the Dominican Republic. She longs to be a writer. She is full of stories and curiosity and dreams. Her family and neighbors don’t have it easy. It is a struggle to make ends meet, and so much depends on the vagaries of the tourist economy. Nevertheless, Ana Rosa’s family is pretty strong, and she has particular love for her older brother who is desperate to create a better future for himself. Seeing Ana Rosa’s talent, her family finds small ways to support her writing and Ana Rosa begins to experience the power of words to create change in the world. When tragedy comes to the family, Ana Rosa’s faith in words and poetry faces its first great test. Writing a beautiful, affecting book is hard. Writing a beautiful, affecting, short book must be very difficult. Joseph’s novel is slim, and yet it examines difficult and complicated issues (poverty, alcoholism, economy in a developing country) in a sensitive and thought-provoking way. You will fall in love with the voice in this book. Ana Rosa is a character you really believe in. It’s strange to feel you have hopes for an imagined person, but you really do hope that Ana Rosa’s life will be rich and fulfilling. This is an eloquent story. This entry was posted in Middle Grade, Openmind, Teacher Titles and tagged Add new tag on May 25, 2008 by shelfelf. (OK… so I know I’m not really supposed to give you the whole poem – but it’s so beautiful and so small and it cannot be broken into two tiny pieces. So, to make up for this, please go read more of Jane Hirshfield’s poetry over at Poetry Foundation). This entry was posted in General on May 23, 2008 by shelfelf. I haven’t joined into the Weekly Geeks fun over at The Hidden Side of a Leaf. Until now. Each week, Dewey offers up a topic related to books and blogging and interested bookish geeks (like me – and you perhaps) create posts on that theme and drop off links at The Hidden Side of a Leaf, creating a delightful collection of interesting, thematically connected posts. Fun, yes? This week, I couldn’t resist the subject: “Choose a political or social issue that matters to you. Find several books addressing that issue; they don’t have to books you’ve read, just books you might like to read. Using images (of the book covers or whatever you feel illustrates your topic) present these books in your blog.” . I’ve only read the last two of these, but the first three have been on my TBR list for months. 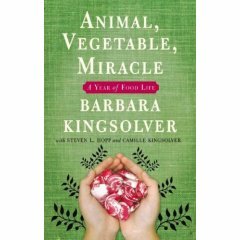 Now that Barbara Kingsolver’s latest is out in PB I will likely succumb and treat myself, having shown restraint for many months. 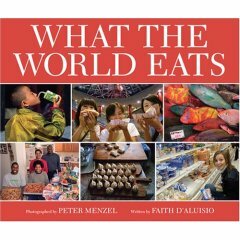 I have to take a moment to sing the praises of What the World Eats because it is such an incredible, eye-opening book (not to mention visually stunning). If you get a chance to take a look at it, you will find profiles showing the amount, the total cost and the types of food eaten by families in 21 different countires around the world. What’s really cool about this text is the photography. There’s a shot of each family along with all of the food they consume in one week. It is so striking to see the remarkable differences between how much and what kind of foods people eat in different countries. When presented in this visual way, the inequality of global food distribution really hits home. This book is amazing for any educator. This entry was posted in General on May 22, 2008 by shelfelf. Now my tummy is doing the Edwin grumble, so I’m off for a mammoth plate (har har) of fish ‘n chips! This entry was posted in Just Cool on May 20, 2008 by shelfelf.